1:20 – The Workboard came to be when Deidre wondered why there wasn’t an app to help managers be better at leadership and managing. 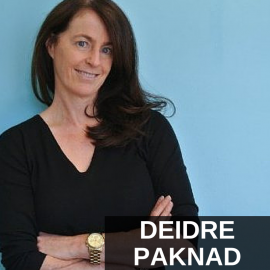 It’s my pleasure to welcome Deidre Paknad to the show. She is CEO and co-founder of Workboard and creator of the first commercial application for legal holds, collections, retention management and founder of Compliance, Governance and Oversight Council. Welcome, how are you? I’m great. Thank you very much for having me today. I’m based in Redwood City, California. Okay, so in the tech area there. So, tell us a little bit about Workboard and how it came to be. Workboard is the idea for Workboard came from my experience after IBM bought my last company and I ended up running a large global team and maneuvering multiple countries with timezones were endless and I just found it phenomenally difficult to take that distribute global team and keep everybody rally around our goals and our mission and get transparency on our progress toward that and I was flying and traveling all over the place, I wasn’t very good at giving people feedback on their progress and I thought, why isn’t there an app to help me be a better manager and a better leader, and decided to go and make one. Yeah, okay, good stuff. So, what does really Workboard do? I mean, there are many project management tools out there, is this a project management tool or not? Not exactly, we look at the job that a line manager has to do, so that’s a manager who manages a function and managing people vs. a project that starts and stops at a certain time or day and for us the manager’s job and we think there are a hundred and sixty-nine million managers in the world all who have basically the same job which is it’s their responsibility to communicate the goals for the team, triage the priorities that change day to day, week to week, month to month, make sure the right work gets done and that they’re holding people accountable in the organization and they’re accountable for the goal achievement in their team. They report progress up line, they give feedback to people who do the work and that’s goals, priorities, work, report status, feedback, that cycle is the same whether you managed finance or you managed marketing or field ops or services it’s the manager’s job and what we look at and think is really important is how do we help managers be great at that and it turns out that Floyd, Gallup and others have reported lately it’s really hard for managers to be great at that. Only 7% of employees in an organization actually understand the goal and what they need to do to achieve it, but 76% use a do-to list. What’s on the list, what are they working on? And then only 13% of people report being energize and really motivated by the work they’re doing. Well, no wonder cause they don’t know the goal of it or the purpose of it, no wonder they can’t connect to it, and then only 8% would say that the performance review they get at the end of the year is meaningful. So, while the manager’s job is the same everywhere it’s really not going that well for people, so there’s this big opportunity for how do we help managers be great leading their teams and it tends to happen when the team doesn’t understand their goal and they don’t know what working on, they have this gap between understanding goals on to-do list. Managers spend all their time triaging what’s going on and they spend all their time reporting up line. So, one of the great things about this is this takes a lot of the, you know, really the tools that even big corporation haven’t always had or used, really takes a lot of that and brings it down to the small and middle size business, right? Yeah, it does and it puts things together that naturally belong together, so instead of the powerpoint that has your goals and excel spreadsheet that has what we’re going to do and emails that said why we aren’t done yet, may be it’s a sharepoint site where we’re packing everything but we can’t figure out whether it’s complete or not complete and then no feedback on the job, simple as that, right, we’re just it bring into a simple app. So, the goals, priorities, the work and feedback they’re all right next to each other, they’re together and all their status transparency is just automatic, nobody has to do any more, so if your capacity restrain right, if your days are too long and you don’t think you’re getting all the right things done and you’re not quite the manager leader you want to be, this tool just lifts your capacity, gives you more time in the day and more headroom to be great as opposed to bogged down in details. So, tell us about, you know, what some of these – the metrics are that people might wanna track, entrepreneurs might wanna track in their business, you know, and how, you know, the software does a lot of this for you, but kind of like talk us through it, if you would, as to how it works, how can we be more effective with this? So, if you’re in a small business setting when of the things that is – and I spend a lot of time with people who lead small business in particularly, it’s don’t – a lot of things don’t have a historical practice of defining specific goals or communicating metrics, so one of the first things that the Workboard app can help with is just making that very simple to-do, stepping you through it in very easy ways. So, we think of that goal setting processes, what’s the mission, what are you trying to achieve? And using language and words that actually inspires people to want to do great things and then that’s, tell me the mission, and then the next step is well, what are the metrics for success? How do we know that we achieve the mission and it really steps you in a very easy way through defining what those metrics are and that might be things like the number of customers just we will achieve or have a certain point in time and the degree of satisfaction or feedback those customers have on our products for our services. And then with that big arching goal everyone in the team, everyone in the company even if they’re not in the same building, can say that’s our goal, we’re trying to achieve or have, let’s say, ten thousand new customers brought to our service this year and we want those customers to rate us every month at least eight of ten in our survey, as an example, and then your team understands, oh okay, we really wanna make sure that we get an eight of ten on a customer satisfaction score that tells people on the team where their effort should go. And suggest that if they’re going to make a decision about something that would please the customer or be convenient for the internal team, please the customer comes first, it just clarifies what matters, what’s most important to the company. I think for teams that are really busy the goals have the effect of saying focus here and don’t worry about those other things that are not a part of our big goals and not a part of our big metric. What can people learn about goals setting and accountability through using the software? You certainly talk about some of it just right there, but many experts will say, you know, don’t have very many goals, they talk about the length, you know, how far out should the goals be, you know, common one is just out of reach but not out of sight. What techniques can people use to really just set and achieve goals more effectively? Yep, we totally agree on the goals should be stretch but they shouldn’t break people, I think that’s great advice, the next is that they should inspire, they should be kind of the morning cup of coffee for the team, right? So, if you describe the goal and even you don’t get excite about it don’t expect anyone else do, right. So, the same kind of language you will use, like in a meeting, like let’s go just blow the socks off this thing, okay that’s the goal and what are the metrics, how we’ll know the socks came off, then the metrics are the quantification. So, it’s kind of combining, if you will, the aspiration, the inspiration with then the measurement, how we’ll know we got to blow the socks off, right. So, I think that there’s, that’s sort of combining the art of the mission with metrics, with the math, right, and they can go together and be more effective when you put them together. The other thing that I think that really matters like a great gallon, less is more because goals will tell you where to focus, if you too many goals they do the opposite, right, they don’t give you any clue what the priority is, so a few goals with clear metrics really, really channels the team energy and you can help by adding to that a framework for people to make good decisions about where their time goes, right. It’s if you have ten competing priorities look at those priorities and say which of these has the most impact on the goals and metrics we’re trying to achieve and do those first and which of these have no impact on the goals and metrics we’re trying to achieve, drop them, let them go, and it can help especially younger people in the workforce who don’t have naturally yet have that prioritization sense, just communicating, this is how we are going to decide to prioritize, it’s going to be based on those things that have the most impact on our goal that can really help and if you have a ton of goals you don’t get that opportunity to focus attention. And then I think the next piece is really important is well what actions will we take to achieve the goal, it’s great that we’re said going to blow the socks off, okay, what am I going to do? And what are you going to do? To achieve those goals and to reduce it to a plan and then work the plan and that consistent working of the plan is crucial. And I think most people tell ya that’s the hard part, the big idea easy, execution unbelievably difficult it’s where managers have to do the hard work. You have to be diligent, right, and you have to hold people accountable and probably half of managers skate out of that, because they don’t wanna have the hard conversations, but it’s where achievement really happens is that diligent execution of the plan. And I think the last piece, especially for goals big and it’s over, let’s say more than a quarter long that’s to celebrate incremental progress, so that as you make a dent in the goal, take the time to really acknowledge and build momentum around, “Wow! look at what we just did, we accomplish this.” And that can get people the resilience for if you will the long hike, right, instead of looking forward saying, ”Oh my gosh, look at how much more we have to go.” There’s this rejuvenation from looking backwards and seeing how far you’ve come and that can help people with lift up and then along with that is this recognizing people contribution to the step that was achieve. You know when people get recognition for their work, they’ll say that’s more valuable to them than money and nothing motivates more than knowing you’re making progress on an important mission and you personally are making a very real contribution to achievement. That’s how you get kicks out of work, right, and it’s how teams do great things together. Right, right, yeah. How granular do you get on the metrics and the, you know, sort of the to-do list, if you will. I mean, you say it’s not project management tool exactly, but.. I think it is at some level it is a series of actions and deliverable to people, right, that’s the common root, so the work is the work is the work, right, and we do think of going from goals and metrics to a specific set of actions and deliverable owned by different people on team and the status of those day in, day out, right, it becomes all the way down to my personal to-do list. So, on my phone I have a to-do list but has actions that relate to core initiative and achievement of goals and I love that alignment, I love it that my to-do list is always in tune with my real goal, right, as opposed to my mail box or whatever. So, in that way there’s like project management it’s just that it’s not defined by or bounded by this project for this period in time it’s elevated, if you will, to a set of business goals over perhaps a longer period of time or the course of a year. The metrics in terms of granularity they – I think more about balancing metrics maybe than going down into details, so just too much details, so you might balance, for example, a metric about the quantity of something you wanna achieve with a balance of quality you wanna achieve, so that might be if we’re going a deliver something to a customer by a certain time period and at a certain quality level, because once you put metrics and goals out there people will try to achieve them, right. So, if you tell them that it’s all about speed and quantity and you make a very aggressive goal they will work in pursuit of the speed and quantity, so balance would say and it needs to be at this certain level of quality, we need to have this, you know, no more defects than X and we need to deliver up this time line, so that you produce the right results. So, when you think about metrics it’s time bound, very specific metrics, to really quantify what it is you want as an outcome with the clear target and then balance those, so you get the real results, the real behaviors from the team that you need for the business. You talked about celebrations and I think that’s very important, I hate to say it I think I overlook it all too much in my own life and my own teams. Do you have some suggestions and, you know, does your software do anything in terms of celebrations? Yes, I have that – I’m guilty as charged. Like I’m just moving on to the next thing, you know. Exactly, it’s done now, right, that’s behind me, right. So, we do a couple of things in the app and one of those is badges and there are a bunch of fun badges and we prompt the manager when work is done, when a high priority item is done or at the end of the week we prompt the manager to take one second and acknowledge, send a cool badge, whether that is a whole in one, or whether it’s a gold cup, or whether that’s a chocolate bar that’s just sweet, something simple, just prompt the manager to take one second and acknowledge what people have done over the course of week or the course of particular work or accomplishment. And then on the goals themselves we have try and forester this whole conversation of the app, which is the whole team recognizing and acknowledging and celebrating, cause it’s, while the manager feedback’s really important, actually turns out that team feedback, peer feedback is equally powerful to bring people together and elevate their performance and elevate their satisfaction they get from work. So, we think peers should be able to give each other badges and pats on the back and little trophies and so on. We think the conversation around accomplishments should be self-elevating and that’s emoticons and things like that and we loop out, so someone comments on our goal, says awesome, we loop out the status on that goal and the comments to everybody else and bring them back into that conversation, just bring people back to goal and bring people back to the sense of accomplishment around goal. Yeah, good stuff. Give out any websites or a Twitter account or whatever you want to people to know. So, people can use Workboard for free, there’s a very cool free for ever app that can help teams go faster, achieve great things together and do that with less effort and that’s at workboard.com and they can follow us on Twitter, of course, it is @workboard inc and Workboard is one word and pretty easy to find and hopefully your listeners will give us a shout out on Twitter and can try out the app. Yeah, excellent, well I can’t wait to try it out myself, I was fantasize by it when I found it. So, thank you so much for joining us today and we really appreciate this, this some good insight.